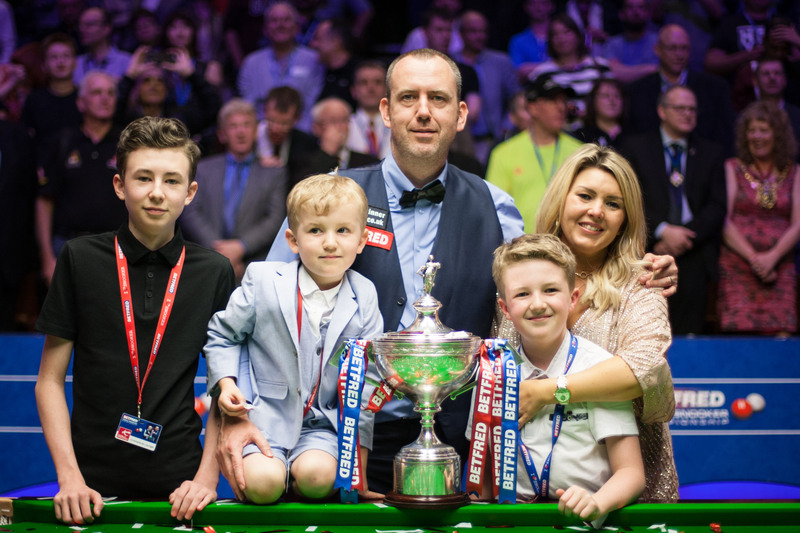 Williams celebrating his World Championship victory with wife Joanne and sons Connor, Joel and Kian. 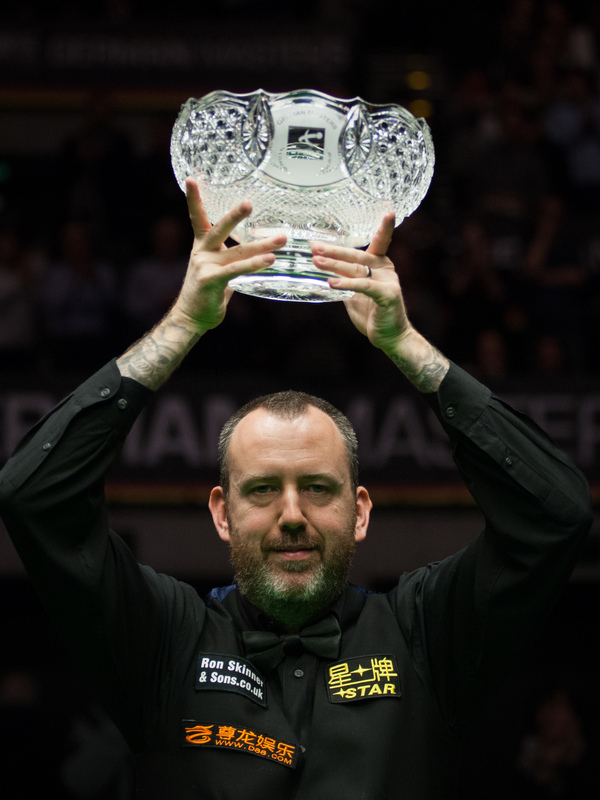 Mark Williams’ 18-16 World Championship final victory over John Higgins in May capped off a history making 2017/18 campaign, which saw the Welshman defy the odds to dramatically return to his best. It was a supreme season from Williams and was the most lucrative of his career, with him accumulating £898,000 in prize money. He claimed his first ranking title since 2011 with victory at the Northern Ireland Open and followed that up by winning the German Masters in Berlin, before his momentous victory in Sheffield. The 43-year-old’s return to the summit of snooker has been one of the most compelling sporting renaissances in recent memory. The meteoric 12-month journey from retirement threats to a stark naked victory press conference at the Crucible was one which compelled the snooker public. Williams became the oldest World Champion since Ray Reardon back in 1978, who was victorious at the age of 45. The gap between when he last claimed the world crown in 2003 was also the biggest in Crucible history. The chasm between his second and third world titles was made more dramatic by the fact that Williams’ three children weren’t even born the last time he won in Sheffield. The world number three admits that being able to share his success with his family was the most special part of the recent victory. The clash with Higgins was 26 years in the making. Since they turned pro in 1992, they have won 51 ranking titles between them, with Higgins having won 30 and Williams 21. However, prior to their meeting in May they had never crossed cues in snooker’s biggest match, the World Championship final. Williams admits that facing his old adversary in a Crucible showpiece for the first time added to the occasion, but didn’t provide any additional pressure. “I think from the quarter-finals onwards myself vs John Higgins was the final that 95 percent of people would have chosen. To see us go at it, because we are two of the older ones of the sport. The other players will get their chance, but everyone wanted to see this clash and I don’t think they were disappointed. Especially on the second day. I don’t think John can play much better than that and I can’t play better than that. “I kept on getting 60 ahead and then he was clearing up. He is the only one that can keep clearing up like that under pressure. That goes for anyone else, including Stephen Hendry or Ronnie O’Sullivan. They aren’t in the same league as him. When he needs that break to clear up, he is the only one that I would put my life on. Such was the transformation in Williams’ game that just 12 months earlier he had considered giving up the sport. It took an intervention from his wife Joanne to convince him to carry on his professional endeavours on the baize. After some fairly extensive celebrations in the off-season, Williams is now turning his attention to the baize in a quest to continue the successes of the last campaign. However, he admits that his victories last term have taken the pressure off.